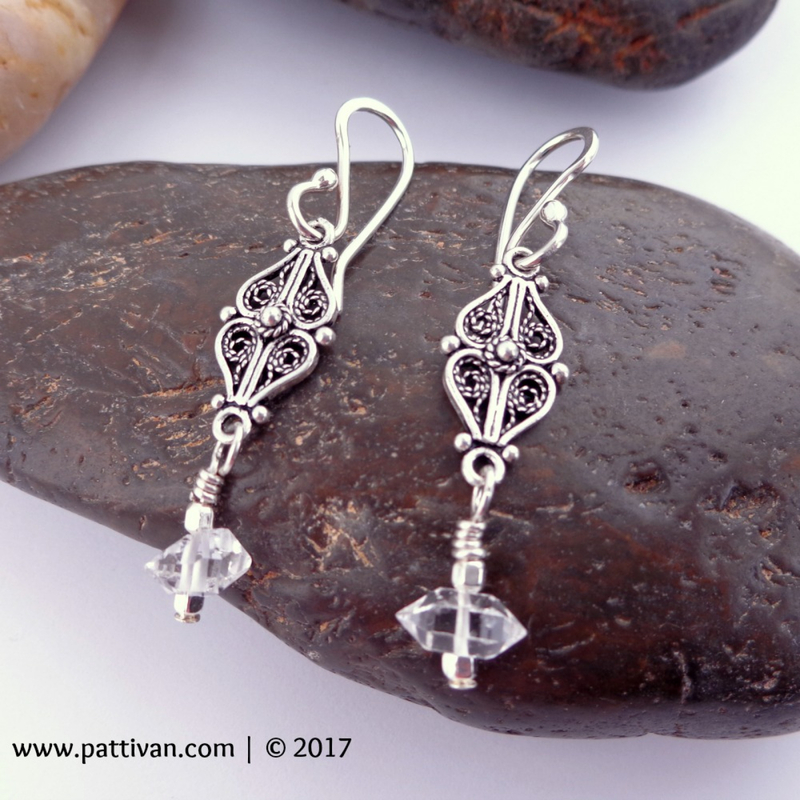 Pretty Sterling Silver Filigree and Herkimer Diamond Drop Earrings. Okay, so Herkimer Diamonds are not actually "diamonds", but double-terminated quartz crystals with exceptional clarity (water-clear) discovered in Herkimer County, New York. The "Diamond" in their name is due to their clarity and natural faceting of this gemstone. This clarity makes it hard for me to photograph how beautiful these little nuggets are! I used beautiful sterling silver filigree drops - oxidized to bring out all the texture of the swirls - and wrapped these shimmering Herkimer Diamond nuggets in sterling silver. These earrings are incredibly lightweight and have such a nice swing when worn! The earrings are suspended from French style ear wires, which I forged from Argentium Sterling Silver, and tumbled for extra strength and shine. The earrings measure aproximately 1 7/8" from the top of the ear wire to the bottom of the earring.